on Friday celebrated Mass in St. Peter’s Basilica for deceased Cardinals and Bishops. During his homily the Pope reflected on the reality of death reminding us that “the faith we profess in the resurrection makes us men and woman of hope, not despair, men and women of life, not death, for we are comforted by the promise of eternal life, grounded in our union with the risen Christ”. Today’s celebration once more sets before us the reality of death. It renews our sorrow for the loss of those who were dear and good to us. Yet, more importantly, the liturgy increases our hope for them and for ourselves. In the Gospel, Jesus strengthens our hope by saying: “I am the living bread that came down from heaven. 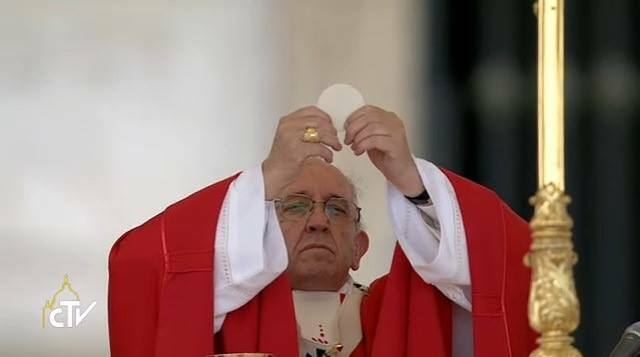 Whoever eats of this bread will live forever” (Jn 6:51). These words evoke Christ’s sacrifice on the cross. He accepted death in order to save those whom the Father had given him, who were dead in the slavery of sin. Jesus became our brother and shared our human condition even unto death. By his love, he shattered the yoke of death and opened to us the doors of life. By partaking of his body and blood, we are united to his faithful love, which embraces his definitive victory of good over evil, suffering and death. By virtue of this divine bond of Christ’s charity, we know that our fellowship with the dead is not merely a desire or an illusion, but a reality. The faith we profess in the resurrection makes us men and woman of hope, not despair, men and women of life, not death, for we are comforted by the promise of eternal life, grounded in our union with the risen Christ. This hope, rekindled in us by the word of God, helps us to be trusting in the face of death. Jesus has shown us that death is not the last word; rather, the merciful love of the Father transfigures us and makes us live in eternal communion with him. A fundamental mark of the Christian is a sense of anxious expectation of our final encounter with God. We reaffirmed it just now in the responsorial psalm: “My soul thirsts for God, for the living God. When shall I come and behold the face of God?” (Ps 42:2). These poetic words poignantly convey our watchful and expectant yearning for God’s love, beauty, happiness, and wisdom. These same words of the psalm were impressed on the souls of our brother cardinals and bishops whom we remember today. They left us after having served the Church and the people entrusted to them in the prospect of eternity. As we now give thanks for their generous service to the Gospel and the Church, we seem to hear them repeat with the apostle: “Hope does not disappoint” (Rom 5:5). Truly, it does not disappoint! God is faithful and our hope in him is not vain. Let us invoke for them the maternal intercession of Mary Most Holy, that they may share in the eternal banquet of which, with faith and love, they had a foretaste in the course of their earthly pilgrimage.